Kanchana Kumara Ariyadasa Dambulla Corr. He was an enthusiastic student and would eagerly go to school every day. His ambition was to educate himself to build a bridge over the canal on the road to his village – something which the government had long forgotten about. He was not looking for a career; he wanted to become a better citizen. Unfortunately for him, a concrete pillar which was being built in his school, with little regard to the safety of the children, fell on his head, ending his life and dreams altogether. The area residents point out that thus far no investigation has been launched by the authorities with regard to this death which could have easily been avoided. A little over a week ago, C.T.L.K. Sasindu Krishan Karunathilake who was studying at Budugehinna Maha Vidyalaya in Kekirawa, Anuradhapura, was killed when a concrete pillar fell on him as he was engaging in sports practices. He was to sit for his O/L exams this year. The concrete pillar was part of a sports stadium the principal had planned to be built at the sports ground nearby. His death has sent shockwaves throughout the community, student community and school. Sasindu was a rising star in his school and his teachers as well as his family had great expectations of him. More importantly, it is alleged that the new sports ground was being built by the principal and another lawyer through ‘donations’ taken from parents who wanted to admit their children to Grade 1 this year. Parents allege that only part of the money was being used to undertake the construction of this playground, which did not adhere to any safety regulations or building standards. This resulted in a concrete pillar falling on the head of an innocent student. The death of this student also led to tension between the school authorities and the students and their parents. As the student’s body was brought to his home in Budugehinna, Dewahuwa, in Galkiriyagama, all who gathered started hold on to his body, breaking down in tears. His friends laid down all that he had loved in his life on top of his coffin as they prepared the body for the funeral. A watch, his cap and his sheet which he used to cover himself every night were among the ‘treasures’ placed on his coffin. 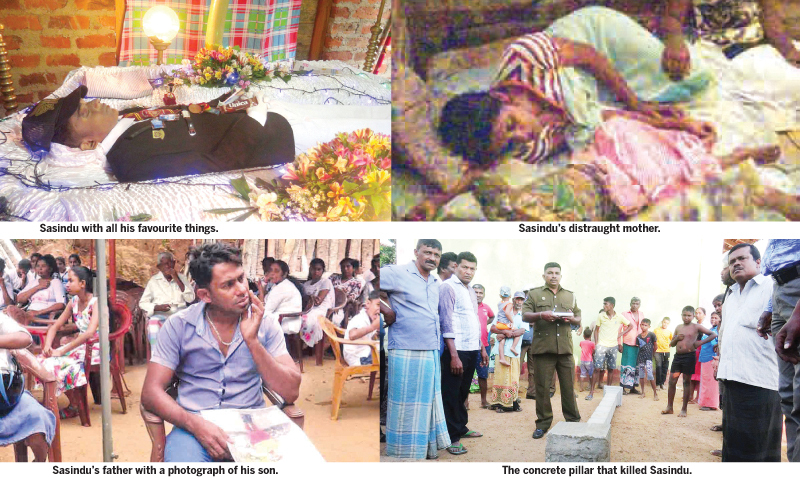 His father, Jagath Dhammika Karunathilake, understandably, had lost all sense of the world as his son’s lifeless body was brought home from school. In his hand, he held a photograph of his son as a child and kept it with him throughout the funeral proceedings. At one time, he went over to the body, touched it and said his son was feeling cold. Thereafter, he tried to cover him with several sheets and cuddle the lifeless body in the coffin. He sat silently as he hugged his dead son. Later he was seen in the garden, holding on to a framed picture of his son, helplessly crying. As those gathered started to pay their last respects to Sasindu, there was not a dry eye to be seen. The Karunathilake family had three boys and Sasindu was the youngest. Their mother, Nimanka Kumari Jayalath simply held on to the lifeless body of her son and cried her heart out. She spoke to no one, only taking breaks to go back to crying. The family faced several economic difficulties being farmers and would spend many a night chasing away wild elephants which would come for their crop. Sasindu too would aid them in their fields whenever they needed help, said the neighbours. Sasindu also helped take care of his grandmother who can no longer walk, and it was his job to bathe her and take her around in her wheelchair. It is quite a distance between Sasindu’s home and the main road. Thus, he would often come to school very early in the morning and stay in school when he had sports practices. On the day he died, he had informed his parents that he would be staying over at the school. Having practised the whole day, Sasindu and a few other students were hanging around the sports stadium which was being constructed when the concrete pillar all of a sudden fell on his head. By the time the area residents and parents brought him to the Galewala hospital, he was dead. The parents, incensed by what had happened, returned to the school and started protesting before the authorities. The other parents who had gathered at the protest pointed out that that the principal, using a private contractor had demolished the old sports stadium and on that very foundation, started to build the new one. The contractors had simply placed the concrete pillars on the foundation without fixing them properly to the ground. This led to the pillar simply toppling over and onto the student. The parents protested asking that the principal and the lawyer supporting him be arrested. They managed to hold the principal in his office for close to four hours on the day Sasindu died. However, the Galkiriyagama Police stepped in to settle the matter. The police arrested the principal and produced him before the Kekirawa Magistrate’s Court, where he was released on bail. “Sasindu was the brightest child in our class. He always asked us to not study just to get a job, but to study to become good citizens and the job would follow. And today he is no more,” said his classmate Malki Subhashini, at the funeral. 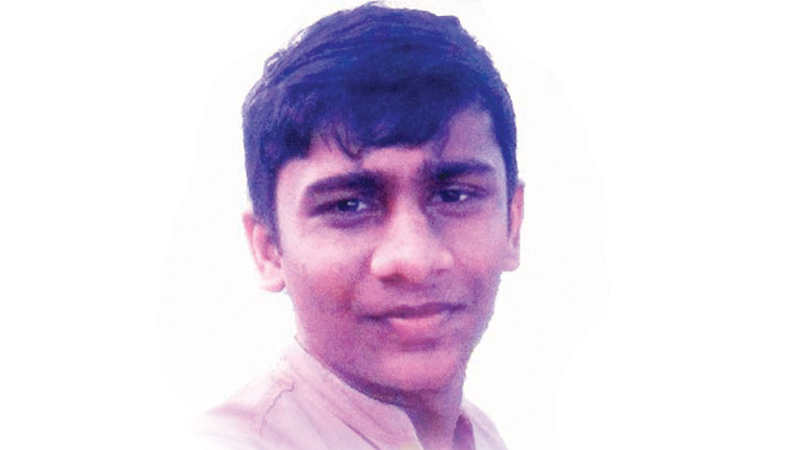 With the death of this student, January 11 was declared a holiday at the Budugehinna Maha Vidyalaya. When this reporter went to the school on January 11, several officers including the Director of the Zonal Education Office had arrived at the school to conduct investigations into the incident. When the Daily News contacted the office of the Zonal Director S.S. Wegolla for a comment, we were informed that he had retired on January 10, and that his acting director was not authorised to speak to the media.